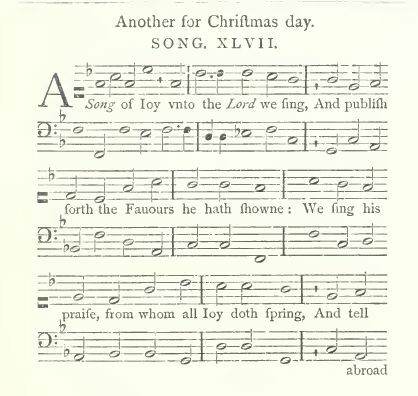 Source: George Wither, Hymns and Songs of the Church (London: Printed by the Assigns of George Wither, 1623, reprinted London: John Russell Smith, 1856), Song XLVII, pp. 182-183. For such were never since the world begun. And flesh a throne above all Angels had. But with the sinful angels dealt not so. And this befell, when God with us was seen. And he hath made us whole, who gave that stroke. Yet we are slack his praises to declare. 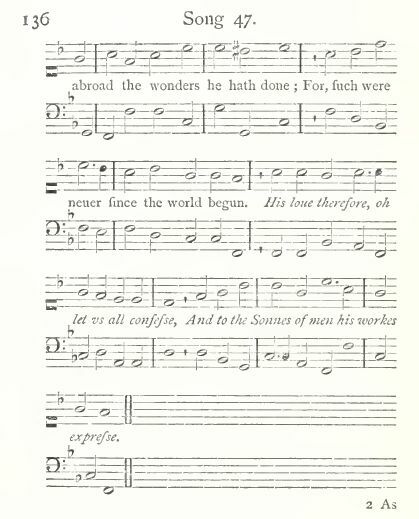 Sheet Music by Orlando Bloom (1623), from George Wither, Hymns and Songs of the Church (London: Printed by the Assigns of George Wither, 1623, reprinted by the Spencer Society, 1881), pp. 135-136. Note from the text, p. 180. This day is worthily dedicated to be observed in remembrance of the blessed Nativity of our Redeemer Jesus Christ : at which time it pleased the Almighty Father to send his only begotten Son into the world for our sakes ; and by an unspeakable union to join in one person God and Man, without confusion of natures, or possibility of separation. To express, therefore, our thankfulness, and the joy we ought to have in this love of God, there hath been anciently, and is yet continued in England (above other countries), a neighbourly and plentiful hospitality in inviting, and (without invitation) receiving unto our well-furnished tables, our tenants, neighbours, friends, and Grangers ; to the honour of our nation, and increase of amity and free-hearted kindness among us. But, most of all, to the refreshing of the bowels of the poor, being the most Christian use of such festivals. Which charitable and good English custom hath of late been seasonably re-advanced by his Majesty's gracious care, in commanding our Nobility and Gentry to repair (especially at such times) to their country mansions.